Thanks to social media, car buyers have tools at their disposal to give your dealership free marketing – and they’re doing it anyway. It’s time that your dealership starts leveraging this marketing.For any business, word of mouth is the best type of marketing and breeds quality customers. It’s cheap and car buyers trust their own networks more than brands and companies. Using social media, shoppers can get information from their own networks about brands, models and dealerships before they purchase. 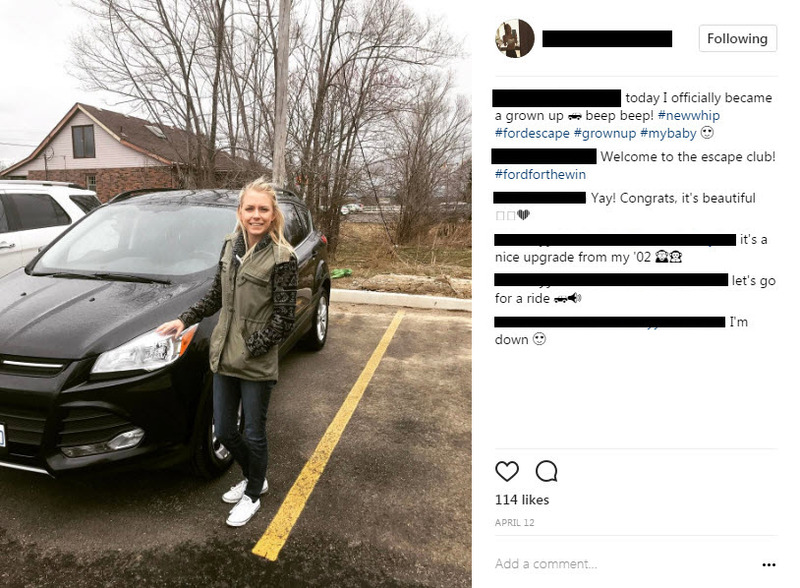 As you’ll see below, car buyers love to show off their new vehicle purchases, especially on Instagram, and why wouldn’t they. It’s conversations like this that your dealership needs to be a part of in order to drive inexpensive engagement and impressions. To share a bit of background, I’m a 23 year old from Brantford, Ontario. The pictures below are people in my own social network on Instagram taken over the last few months. There’s a few very important things to note here outside of the social media engagement: all of these buyers are between the age of 22-25 and female. Additionally, 3/4 vehicles purchased are SUVs. Not only are these segments growing, but they are the most engaged users on the fastest growing social media platform in the world, Instagram. The first and most important step is to be active on Instagram. If your dealership isn’t there already, here’s 5 Reasons Your Dealership Should Use Instagram. In this example the image location is tagged as Dubois Honda. In order to ensure that your dealership location can be tagged, check if it exists as a location in Instagram already. If not, you can create a custom location by following these easy steps. Having a location tag allows users to view all images that have used this tag and directs those users back to the dealership location. In this example the user included two really strong hashtags that can point back to the dealership. A handful of other users have used these hashtags in the past as well. If your dealership doesn’t have hashtags like this already in use, create some and encourage buyers to use them. When you sell a car offer to take a photo for the user. Encourage them to tag your location, your dealership Instagram account and the hashtags you want to run with. Creating a small takeaway for the buyer can help with this. 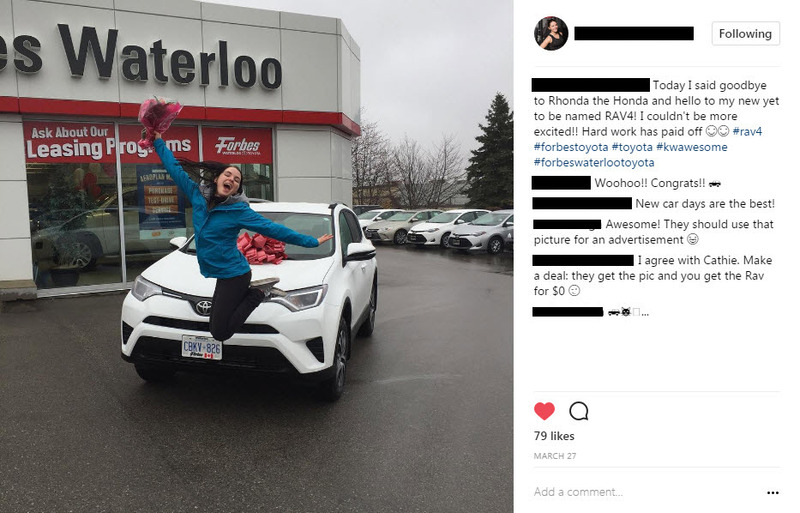 Using your custom location, notifications from posts that have tagged your Instagram account and seeing what posts have used your hashtags allows your dealership to follow up and get involved with these conversations. Leave a comment on these posts saying something as simple as, “Thanks for shopping with us [buyer]! It was a pleasure!” It’s a small step that can help your CRM go a long way and potentially generate leads through the comments. Interested in learning more? We’d love to hop on a call and chat about how we can help your dealership succeed on Instagram. Get in touch!